At AdVINEtures we know we have been blessed with more than our fair share of good luck. Over the past few years we have been very fortunate to meet and taste with some of the top winemakers in the world. Any time you are able to meet, talk with, and learn from those people who are the very top of their game, you are very fortunate to get such an experience. On a recent trip to Woodinville, WA we had an unexpected experience, one that happened purely by chance. We were sitting in the lobby of our hotel when a familiar looking man walked passed our table and took a seat nearby us. We turned to each other and asked “Could that be Philippe?” For those of you that may not know who this gentleman is, Philippe Cambie is one of the world’s greatest living oenologists. 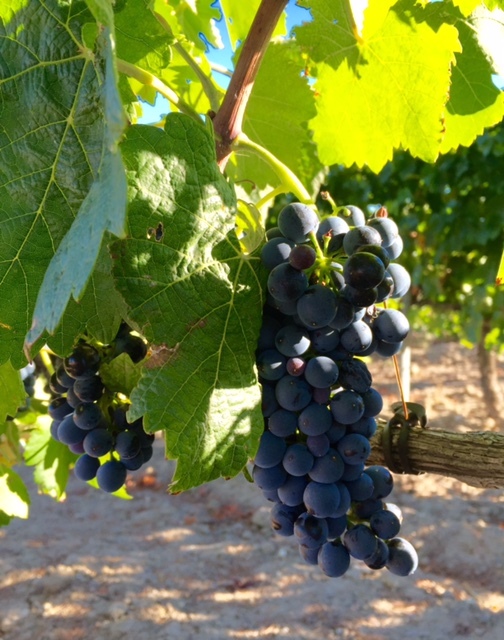 Oenologists are consulting winemakers and can be thought of as a “winemaker’s winemaker”. The oenologist’s craft is an arcane one, helping winemakers make wine. A lot of the winemakers of the world have healthy egos, particularly if they are good at their craft. In order to get a good winemaker to seek your advice, you had better be pretty good. Over the years we can think of four oenologists that have achieved great fame. Emile Peynaud’s career spanned 46 years beginning in the 1930s in Bordeaux. He published over 300 treatises on winemaking and wrote several books including the famous The Taste of Wine (1980) and Knowing and Making Wine (1982). Peynaud was a tireless worker, advising at one time 70 wineries, mostly in Bordeaux. These included some of the best of the best: Chateau Margaux, Leoville Las Cases, Lynch Bages, Pontet Canet and others in California, Spain, Italy Chile and Peru. Peynaud can be credited with using rigorous scientific study to convince winemakers to pick later, to control malolactic fermentations, and pioneered the use of cold macerations and focused on new methods of tannin extraction. His influence on the wine world is still felt today and cannot be overstated. The 2001 BV Georges de Latour Private Reserve. Another famous oenologist was André Tchelistcheff, who was born in Moscow but plied most of his trade in California. Tchelistcheff met Georges de Latour in Paris and the latter convinced him to move to California and become head winemaker at his Beaulieu Vineyards in Napa. Tchelistcheff’s contributions to California winemaking were numerous. 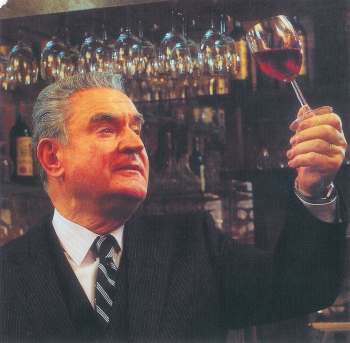 He brought over the idea of using small French oak barrels for ageing wine, was strict about absolute cleanliness in the winery, and encouraged cold fermentations among many other techniques that served to define the style of California wines, especially Cabernet Sauvignon. 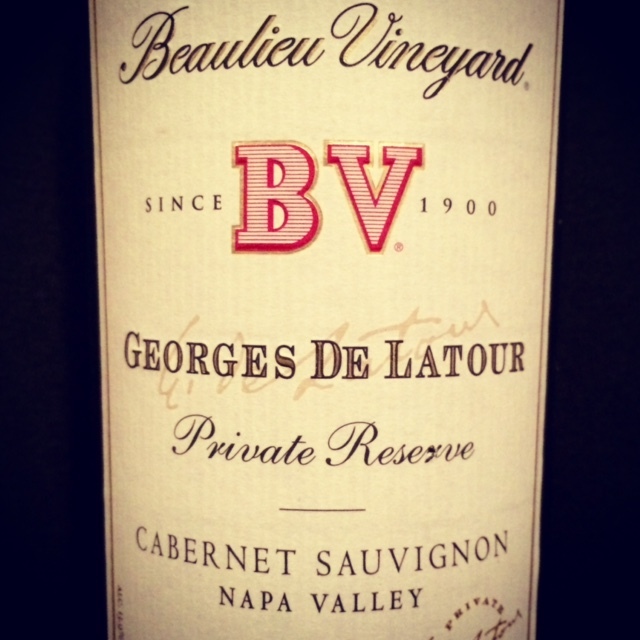 Many think his crowning achievement was the numerous excellent vintages of Beaulieu’s top Cabernet Sauvignon, the Georges de Latour Private Reserve. (We can attest to its greatness and have drunk several vintages, going back to the 1978. The 1997 is one of our favourite California wines). Interestingly, Tchelistcheff thought that his Pinot Noir might have been some of his best wines. Tchelistcheff’s nephew, Alex Golitzen, went on to create Washington State’s arguably greatest Cabernet Sauvignon, Quilceda Creek. Tchelistcheff also consulted to other top wineries such as Heitz, Jordan, Grgich, and Neibaum-Coppola from California, and Chateau Ste. Michelle from Washington and Erath from Oregon. Tchelistcheff died in 1994 after an illustrious 56 year career. Still with us today is the globe-trotting oenologist from Bordeaux, Michel Rolland. 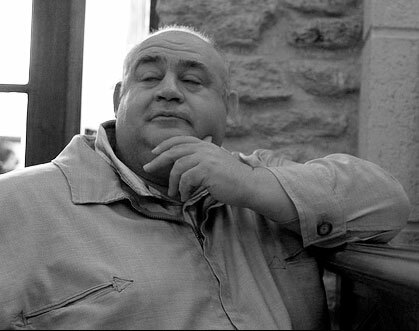 Rolland has at times been controversial, but his influence as an oenologist is beyond dispute. He works with more than 100 different wineries in 13 different countries. His home, and his laboratory, that he shares with his oenologist wife Dany, is in Libourne on Bordeaux’s Right Bank. Nearby in Fronsac is their winery, Chateau Fontenil. Rolland’s client list includes a who’s who of Pomerol and St. Emillion that numbers super stars such as Angelus, Pavie, L’Evangile and Clinet as well as such California cults as Bryant Family, Dalla Valle, Harlan, Araujo and Sloan. 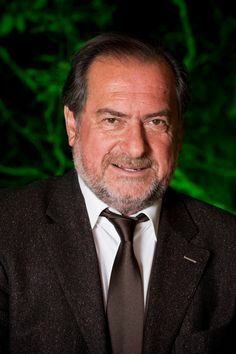 He also consulted to the Antinori family and has advised at Masseto and the recently created super Tuscan that is doing wonders with Cabernet Franc, Tenuta di Biserno. The controversy that is sometimes attached to Rolland is the accusation that he makes formula-driven wines that push the envelope in terms of ripeness and use of new oak, all to please the palate of highly influential Baltimore wine critic, Robert Parker. This point was pushed, and we think rather unfairly, in the film Mondovino. We have tasted many of the wines he has consulted on, from the Right Bank and from California and can therefore vouch for his expertise. A recent tasting of the wines of Tenuta di Biserno locked down our opinion about his talent. While there are other great oenologists and consulting winemakers today (certainly Helen Turley of California, Stephan Derenoncourt of Bordeaux, and Italy’s recently deceased Giacomo Tachis are due acknowledgement, as are others) none has had the same influence as Philippe Cambie. What Rolland and Peynaud are to Bordeaux, Cambie is to Chateauneuf du Pape. Philippe was born in southern France’s Languedoc region and his mother’s family had vineyards at Domaine de Mt. Plaisir. But Cambie’s first career direction was food, not wine as he graduated from a technical university in the food industry in Montpellier. Not fully satisfied with this he enrolled at Montpellier to complete a Degree in Oenology (1986). From there he held numerous different jobs within the wine industry, culminating in joining the consulting group ICV Group/VVS Rhone Valley in 1998. 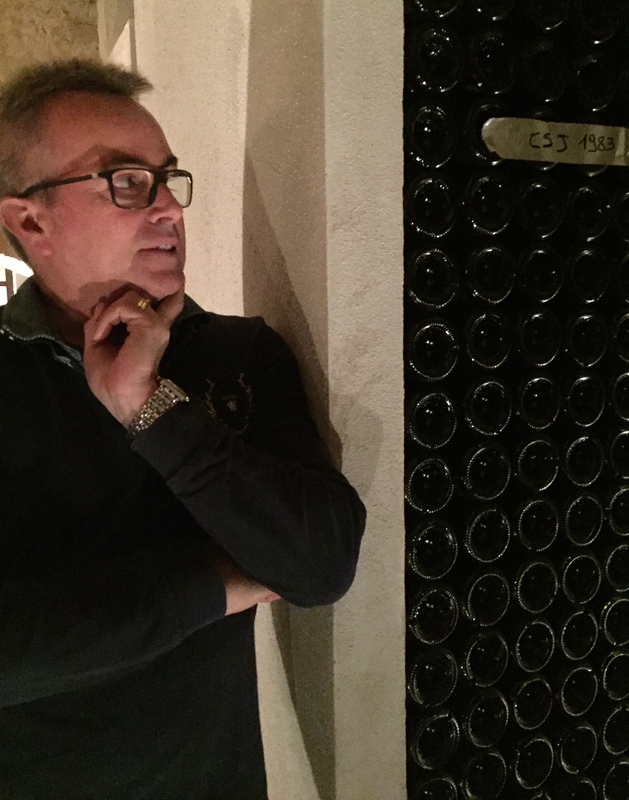 Winemaker Vincent Maurel of Clos Saint Jean. Philippe sat in the lobby of our hotel and was joined by another legendary winemaker, Todd Alexander, formerly of California’s Bryant Family and who is now making incredible wines at Washington’s Force Majeure. After Todd left (we had a meeting with him scheduled for the next day) we summoned up the courage to go over and say a quick hello to Philippe Cambie. (We are sheepish about doing that, not wanting to annoy famous people, but, what the heck, we would be very quick, and this was an opportunity we just could not turn down). 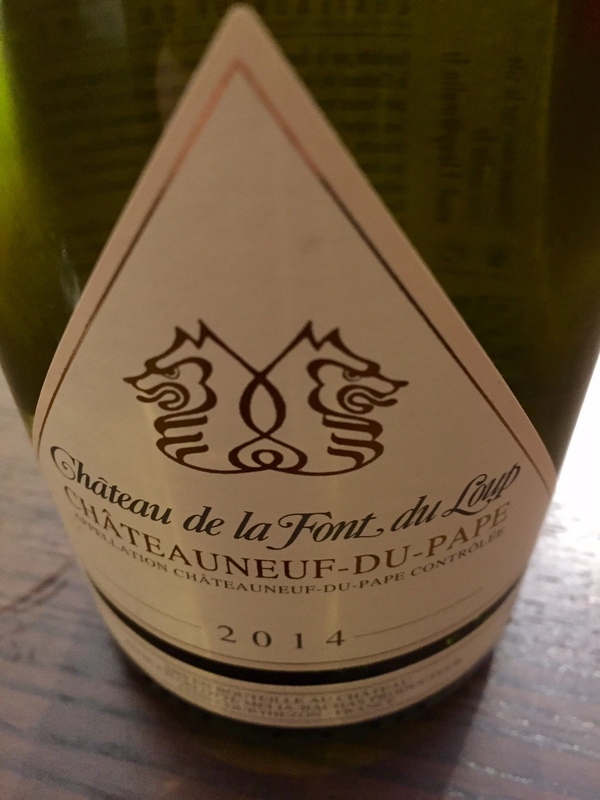 We introduced ourselves and told him we were big fans of many of his wines that he consulted to and that we had just returned from a trip to Châteauneuf-du-Pape. His face lit up a bit and he asked what we thought and we told him about what a great time we had. We told him that we tasted with two of his clients, Vincent Maurel of Clos St. Jean and Laurent Bachas of Font du Loup. His face lit up even more and he invited us to sit down. And so began over an hour of chatting with one of the world’s most famous oenologists. Our discussion with Philippe was absolutely fascinating; he has an incredible wealth of knowledge about wine, about Châteauneuf-du-Pape and about the people of the region. 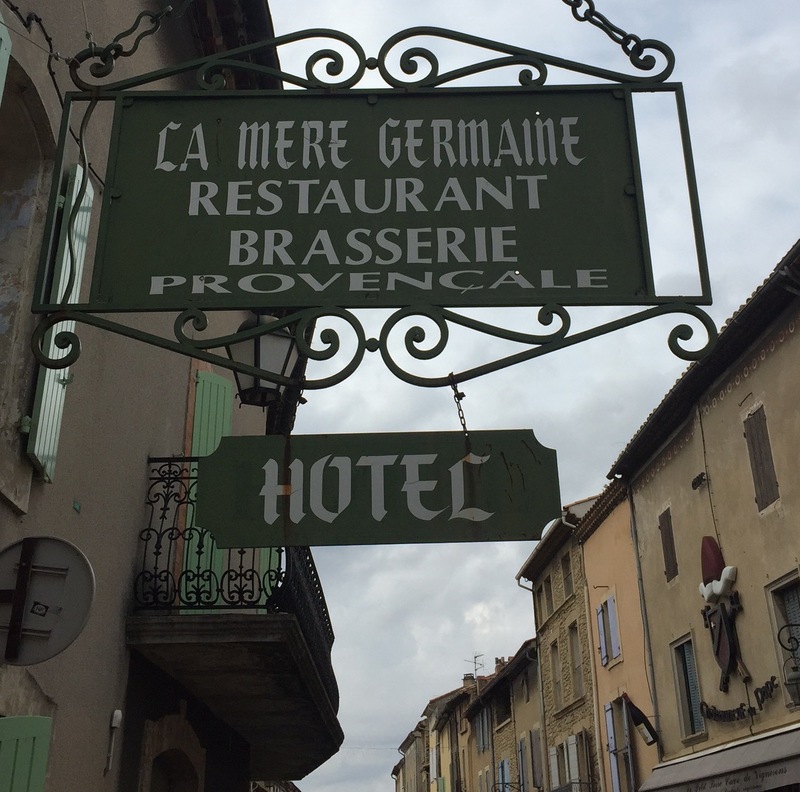 We talked about our shared admiration for David Rocamora and his restaurant in Châteauneuf-du-Pape, La Mere Germaine. As we were chatting we noticed the hotel was offering glasses of wine to their guests as a part of their daily reception. We asked Philippe if he would like a glass and we all had one. What was being poured was a serviceable wine from a local (Washington) winemaker. We took a sip and it was fine, but certainly nothing remarkable. Philippe did not make a face, but it was still evident he was not wowed by what he was drinking. We ventured “we are not going to have a glass of wine with Philippe Cambie and serve him plonk. Let us go to the bar and order something decent. Philippe, would you prefer white or red?” With that big friendly smile he quickly rhymed back “in the middle of the day, Chardonnay!”. With that I whipped over to the bar and grabbed the list of the wines by the glass. The list was nicely curated, but nothing on it that would really redeem us from the first wine we offered. Only a good bottle was going to get us out of this mess. So there I was, at the bar, frantically flipping pages of the wine list trying to come up with something that might indicate to the world’s greatest living oenologist that we were something more than complete philistines! The pressure!! We decided that when in Washington drink the local stuff; besides, Washington makes darn good wine. We settled on a Chardonnay from Ashan Cellars who sourced their grapes from the highly regarded Celilo Vineyard near Yakima. Philippe seemed very pleased with our choice, but to be honest, he has such a gentle way about him that he would never pull any wine snobbery on you. Our conversation was not just about wine. It was great to get to know a bit about the person behind the wine. If there is one thing that we would like to do at AdVINEtures, it is to be able to tell our readers some of the backstory behind the wine, and give them some insight to who has created what is in their glass. 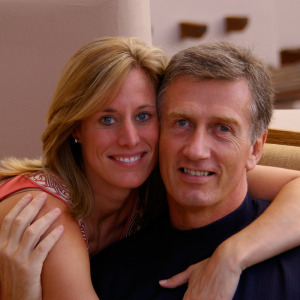 Philippe is an avid rugby fan and was an accomplished player in his youth. But rugby takes its toll on you physically and he showed us the ring finger on his right hand which can no longer be fully straightened after being severely broken in a match. It was a small window into the drive and passion that makes up a big part of the personality of this thoughtful and intelligent man. Our time with him flew by. Philippe Cambie is a kind and gracious person. He is incredibly knowledgeable and is wonderfully friendly in how he expresses it; he is very down to earth. Not to mention he is responsible for some amazing wines! What a chance meeting and how kind of him to sit and chat wine with you. I would have been so nervous about selecting a bottle! I find it’s so much pressure bringing a bottle with all my friends that work in the Bordeaux wine industry. That scenario probably would have made me physically sweat. Very cool! And Ashan (by Chris Gorman, Gorman Winery) and Woodinville are two of my favorites! Wow, what a great story. What makes it even better is that he was so friendly and accommodating which is not always the case with chance encounters!! We weren’t sure how we’d be received but to get almost 2 hours of his time unscheduled talking about CDP was such a treat! Another great post. What a coincidence. NOW LET’S LOAD UP THE TRUCK WITH THE 2016s!!! Lol…working on the flights/truck rental now! Cheers Paul!